What is HydroMassage and how does it work? way to relieve tension and muscle soreness. How long does a HydroMassage water treatment take? Minimum treatment at Sun City is 15 Minutes but user can add 15 Minute increments for $5 per 15 Minutes. So 30 minute, 45 minute and 60 minute massages are not uncommon. 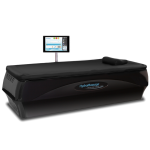 Can I target certain areas of my body with the HydroMassage Bed? Yes, HydroMassage water massage treatments can be adjusted to your specific needs.